“Words Fitly Spoken: Lincoln and Ellison as Writers of Social Responsibility” by Lucas Morel, Professor of Politics and Head of the Politics Department, Washington and Lee University. 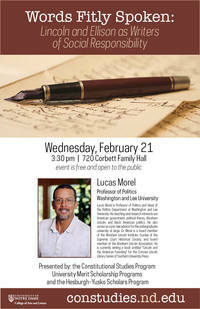 Wednesday, February 21, 3:30 pm in Corbett Family Hall, room 720. This event is free and open to the public. In the talk, Prof. Morel will discuss Abraham Lincoln’s and Ralph Ellison’s ethical leadership and how, through their speeches and stories, they challenged the American people to trust their political principles. The lecture will explore how Lincoln and Ellison promoted the civic health of the nation by diagnosing its public ills, and how these two great Americans offered direction for their country to better align its practice with its professions. Presented by the Constitutional Studies Program, the University Merit Scholarship Programs, and the Hesburgh-Yusko Scholars Program.